The Russian Navy took control of 51 Ukrainian ships and the trained dolphin program in Crimea. The navy dolphins will now serve in the Russian military. 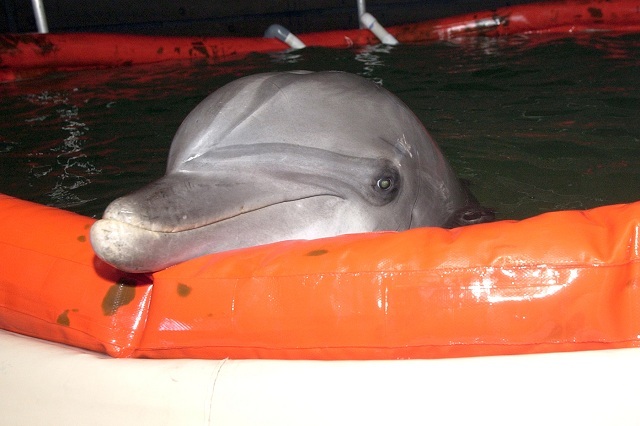 The combat dolphin program in the Crimean city of Sevastopol will be preserved and redirected towards the interests of the Russian Navy, an employee at the facility where the dolphins are trained told RIA Novosti. The program, dating to the 1960s, was previously scheduled to be disbanded by the Ukrainian navy in April, but the facility and the dolphins themselves have now become Russian following the reunification of Crimea with Russia last week. “The oceanarium’s engineers are developing new instruments for new applications to boost the operational efficiency of the dolphins underwater,” the employee said, requesting anonymity. The employee added the animals are currently outfitted with extremely outdated equipment. The dolphins are trained to patrol open water and attack or attach buoys to items of military interest, such as mines on the sea floor or combat scuba divers trained to slip past enemy security perimeters, known as frogmen. Man-made sonar systems are often incapable of detecting such small objects in crowded environments such as harbors.